The Last Akaway is good. It is about you having a spirit animal. I know my spirit animal ( I have three: Mr Hungry the Penguin, Lucy the Black Leopard and Raven). I like the idea of spirit animal. In this book, Brody Boondoggle finds his spirit animal. His friend doesn’t believe in Akaways. The friend’s uncle makes video games and they are trying to stop him because he somehow the video game to the world. If they don’t stop him, the Akaway will be saved. 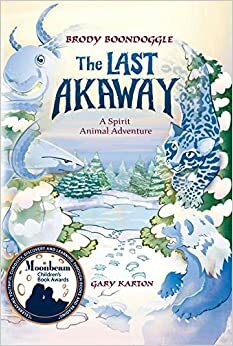 I liked this book because it helps connect to spirit animals. It was a fun book to read. It is longer than most books I review and it took me a week to read. It is for kids a bit older than me but I read books at a higher grade level than mine. The next book in the series comes out this spring and right now, there is a deal on the book. I am excited they have a Raven necklace. I am getting it!